American Dance & Music presents adult dance classes at The Dance Hub in ballet and modern dance. These classes are especially geared for adults of all ages and experience levels, ranging from absolute beginners to professionals. The Dance Hub offers a course for absolute beginners in ballet that teaches students form, alignment, posture, musical awareness, and the safe working procedures that will assure their enjoyment of dance for years to come. These students then progress through additional beginner and intermediate ballet classes that teach both technique and artistry. 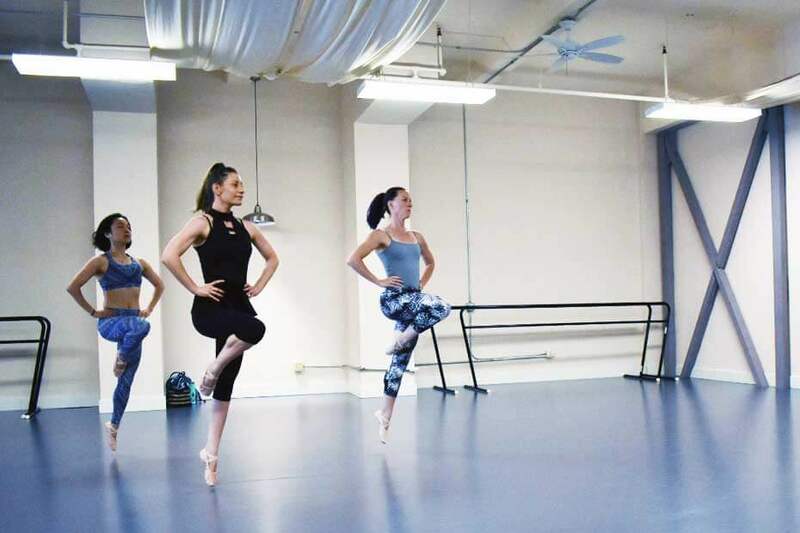 In addition, The Dance Hub offers movement classes that help adult dancers maintain their body’s strength and fitness, including Pilates, Klein Technique, and Restorative Foam Roller. The Dance Hub studios offer state of the art dance floors that will help you perform to your fullest and minimize the risk of injury. Find out more about our classes below. Students can take classes in a wide variety of dance and movement forms through our affiliate instructors, including Nia, Hula, Tahitian Dance, Belly Dance, and Flamenco. Note that these instructors charge their own rates for these classes and AD&M Class Cards do not apply. See the Affiliate and Rental Classes offered at The Dance Hub here. The Dance Hub is now excited to offer kids’ ballet classes. Find out more and sign up here.